The largest of the Canary Islands, Tenerife offers year-round warm weather, lush vegetation, beautiful shorelines and volcanic landscapes. It’s an ideal destination for those who want to enjoy a relaxing beach break, as well as offering a range of activities. 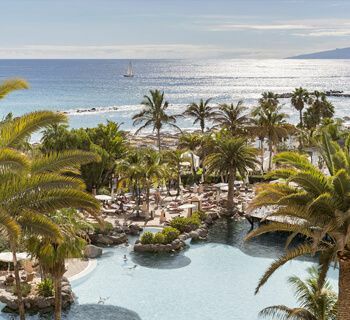 Tenerife luxury holidays invite you to enjoy the island’s stunning scenery and attractions while staying in top-class hotels. Tenerife is home to a variety of natural wonders, from tropical forests to volcanic lava caves. The island is dominated by the snow-capped Pico del Teide - the tallest peak in Spain. In the northeast of the island is the Anaga mountain range, which can be explored by foot or on thrilling 4x4 safaris. Nature-lovers will relish the chance to visit the lush Risco Bello Aquatic Gardens. Shrouded in citrus trees and tropical plants, the gardens are home to an array of wildlife, including herons, dragonflies and many birds. The cascading, 18th-century gardens at the Jardínes del Marquesado de la Quinta Roja are also well worth a visit. The picturesque beaches are another major draw for visitors. Many 5 star hotels in Tenerife are located along the island’s coastline, offering spectacular sea views and easy access to the golden sands. Watersports are also available on most beaches, including swimming, snorkelling, canoeing and surfing. You can also take leisurely boat trips around the coastline or go on dolphin and whale safaris. Tenerife’s rich culture can be seen in its many notable buildings. For something unique, visit the Museo de la Naturaleza Y el Hombre to see its bizarre collection of mummies and skulls. Another must-see building is the Auditorio de Tenerife. This white auditorium was designed by the renowned Spanish architect Santiago Calatrava, and visitors can book a tour for a glimpse behind the scenes. For a taste of the island’s history, head to the Casa de los Balcones. This ornate mansion was built in 1632 and is filled with antiques and memorabilia. Don’t miss the room dedicated to lacework, where you can see fine examples of traditional Tenerife lace. The site also has a bodega complete with an antique Lagar wine press once used to make banana liqueur. When it comes to food, Tenerife has plenty of delicious cuisine on offer. Sample the island’s favourite potato dish, Papas Arrugadas, which is often served smothered in spicy red mojo sauce. More traditional Spanish dishes such as chorizo sausage and paella are also popular and can be found on restaurant menus across the island. If you fancy a tipple or two, try the locally-brewed beer called Dorado or a glass of the local wine from the vineyards. At Azure, our selection of luxury hotels in Tenerife offer guests first-class comfort with hassle-free access to the island’s beautiful landscapes. To find out more, don’t hesitate to get in touch with our experts by phone or live chat. Situated on the beautiful coast of the Atlantic Ocean, Hotel Bahia del Duque offers guests their very own piece of heaven. Take time out from modern life and immerse yourself in the unrivalled luxury of this world-renowned resort. Enjoy losing track of time as you admire the colonial architecture of the hotel and savour the natural splendour of the surrounding landscape. 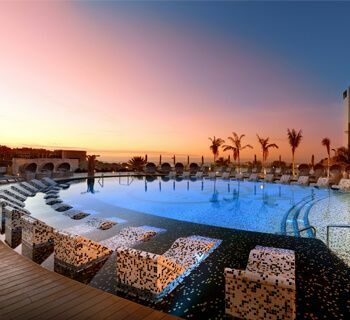 Live like a superstar at the Hard Rock hotel, Tenerife, where everything is always rock and roll. 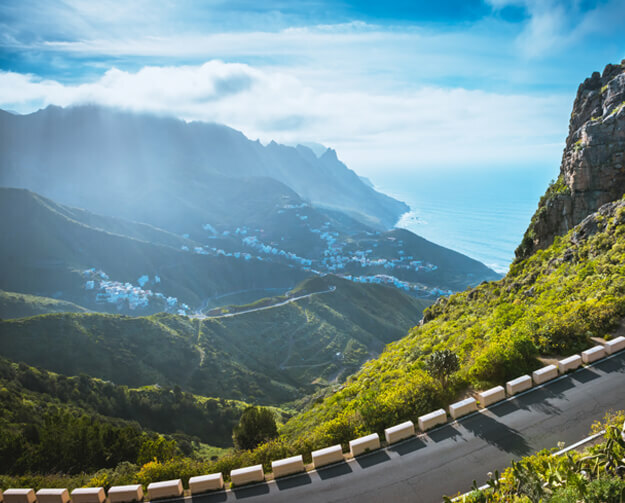 From smart, glamorous rooms and suites to the sumptuous Rock Spa, make like a rock star on your next holiday to the Canary Islands and let the good times roll.